Our church membership is over 450, and our attendance on Sunday morning at this time of year is between 230 and 300. Our capacity is 350. We are a growing congregation and hope that you will come and help us to grow further. 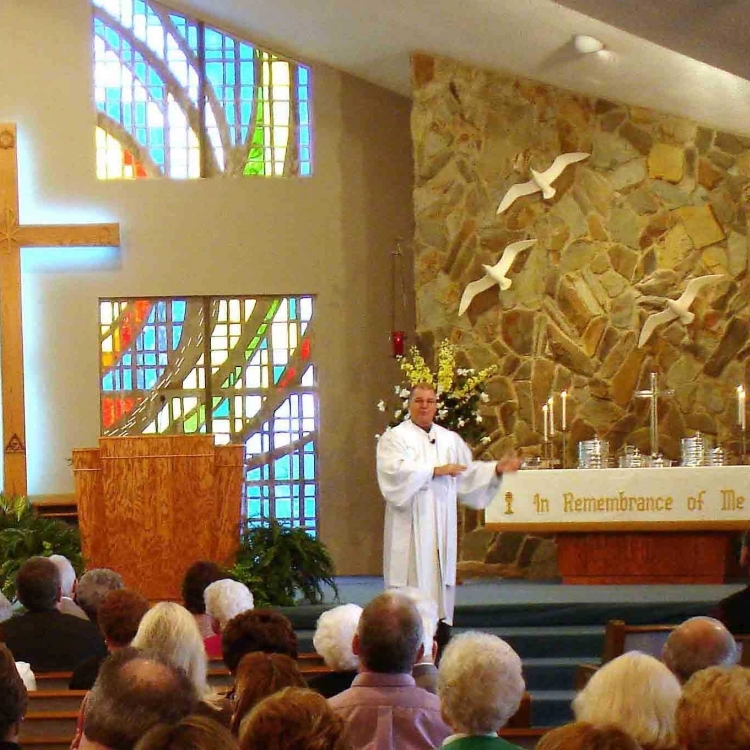 Our Worship Service is a Modern Traditional Service with a blend of Formal Rituals and Informal Atmosphere. We have the Tradition Choir, Hymns, Bulletin and Liturgical Robes but the congregation is encouraged to be relaxed and be at home. If you like the more formal service without all the standing, sitting and kneeling come join us at this hour. You can watch one of our Sunday Worship services by clicking on the TV screen on the Home page. We meet every week, two times a day, studying the same session at both times. Most of the lessons are verse by verse Bible Study. Often we do a series of study on a book or topic of the Bible. You can join the class at any time and still keep up with the topic. Sunday School For Adults:We have an Adult Sunday School Class at 9:15 AM every Sunday morning. Our topic are inspiring and varying with lots of participation from members. We do a different approach to Sunday school. We have a “Children’s Church” for ages Kindergarten thru 4th grade, with a nursery for younger children. The children come to the worship service to hear a “Children’s Sermon” from the pastor and then proceed out to “Children’s Church.” There, teachers go over with them the bible lesson from church and help them to work on a study of the message. The youth age are encouraged to attend services as an adult, sitting with fellow youth, and then to attend “Youth Group” that evening for their Bible Study.